The Boston School of Electrolysis™ has grown to be America’s First and Only Online Classroom For Ongoing Electrolysis Education©. It is my professional opinion that other electrolysis associations, guilds and societies are deliberately ignoring the interests of its members that are State Licensed and Registered Electrologists. This disrespect is unfair and discriminatory for there is not one legitimate reason why a State Licensed and Registered Electrologist should be required to pay up to a third more than the non-licensed electrologists to belong to the same electrolysis association or group. Furthermore, it’s an insult to the state licensed and registered electrologists who are forced to pay abnormally high prices for outdated Certified Educational Upgrades that they learned in Electrolysis school. In my professional opinion the educational quality and content of this course exceeds any known Certified Educational Upgrade presently offered by electrolysis associations run by non-licensed electrologists. This course if free for your inspection and if you intend to use this course as a Certified Educational Upgrade for your state board license renewal after completion you can submit an essay or report. From they’re I will certify and issue you a numbered certificate of your successful completion to submit your required Certified Educational Upgrade for your state board license renewal. The The Electrologist’S Diagnostic Case History© Form is approved By The Five Star Electrologists Guild. It's an inexpensive way to get a Certified Educational Upgrade. 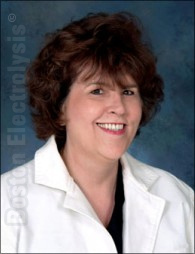 The Electrologists Diagnostic Case History incorporates a wealth of information based on 26 years of experience and professional expertise of Kimberly Williams, R.E, Massachusetts Licensed and Registered Electrologist and Dean of Education at the Boston School of Electrolysis™. This work includes a complete and thorough five part Certified Educational Upgrade with a detailed step-by-step instructions to help you guide your patients through a full disclosure of their medical history right up to their present medical status to document your pre-treatment screening procedure. A compete thorough diagnostic case history is paramount for the patients safety and for the electrologist to be able to render their patients the best attainable care and treatment. The Electrologists Diagnostic History educates the electrologist in new methods and techniques that improves your practical abilities and professional reputation. A thorough and complete history insures you and your patients well being and safety that can be completed in fifteen to twenty minutes. In addition, as part of this package, you also receive an 8.5 x 11”, two-sided master case history card in PDF.File format so you can print from you computer as many copies as you need. If you wish to use this course as a Certified Educational Upgrade, a numbered certificate of successful completion will cost $25.00. Click on the image, below or click here to order or learn more. Into the bargain, as an added bonus you will receive the official copyrighted Five Star Electrologists Diagnostic Case History Card© with a numbered template that is 8 1/2 “ X 11’’ double sided so you make as many cards as you need for own personal use. There is more, this also includes the Five Star Electrologists Diagnostic Case History Booklet in PDF File format for your own personal use. Hold on, there is even more, essays or reports of distinction have the option of being notified listing your name, practice, phone number and a brief biography for three months for an additional $25.00. I like to quote for the record where can you find a Certified Educational Upgrade with a numbered certificate of completion, a master case history card front and back, instruction booklet and having your essay-report posted for three months on the best privately owned electrolysis website for state licensed and registered electrologists only, for a mere $50.00? On top of that if you decide to join The Five Star Electrologists Guild™ Americas only guild for the state licensed and registered electrologist it will be deducted from your membership. You will not get a better deal anywhere. Please feel free to take the time to tour The Boston School of Electrolysis™ and its other branches and the newest being The Five Star Electrologists Guild™ for the state licensed and registered electrologist only. Please visit that link on this site and click on the Five Star Electrologists Guild™. Please, take your time to browse through this State of the Art revolutionary electrolysis information and educational website. I ask you never to forget that The Boston School of Electrolysis™ and The Five Star Electrologist Guild™ primary goal of ongoing education is to advance our professional abilities and reputation. In today’s trying times, remember that you the licensed and registered electrologist are the consumer’s best and only choice for Safe Permanent Hair Removal.